Playing Time 15 min. to 120 min. Collect all the cards of your suit while out-smarting your opponents. Will the King grace your cards? Or will you fall victim to the fiendish Fiasco? 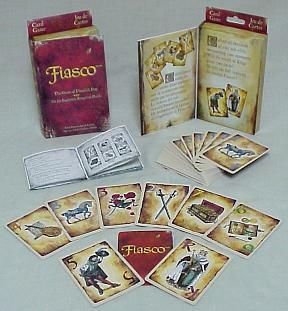 Fiasco is a recently discovered card game thought to date from the Italian Renaissance of the late-1450s. Fiasco distinctively incorporates six suits representing symbols of power and wealth and features the legendary character Fiasco. The game Fiasco is believed to have been a popular pastime of royalty and rogues where players took great delight in upsetting the plans of their opponents. A game for advanced card players, Fiasco is easy to learn but a challenge to master. First, select your favourite suit. Choose from horses, swords, mandolins, roses, books or treasure chests. Now do your best to collect them all. Play high cards to win the pot and accumulate points. But here’s the twist: Playing high cards also gives your opponents the opportunity to hit you with Fiasco penalty cards. Avoid the danger by laying low, but loose the chance to win your points. So what card do you play? Do you try to collect cards and score points, or do you strike your opponents with penalty cards? Do you plan a defensive strategy, or do you have the guts to be aggressive and use your powerful Kings? If you take the risk you could win big, or you could loose it all. Think you can win? Are you clever enough to outsmart your friends? It’s a battle of wits. It’s a trick. It’s a Fiasco! The game of fiendish fun.